The principal organs of the respiratory system are the nose, pharynx, larynx, trachea, bronchi, and lungs (Figure 1). The airway from the nose through the larynx is often called the upper respiratory tract (that is, the respiratory organs in the head and neck), and the regions from the trachea through the lungs compose the lower respiratory tract (the respiratory organs of the thorax). During normal breathing, the airway is open and air passes freely through the nasal cavities (or oral cavity), pharynx, larynx, and trachea. The trachea or “windpipe,” is a rigid tube about 12 cm (4.5 in.) long and 2.5 cm (1 in.) in diameter, that lies in front of the esophagus (Figure 1 and 2). The trachea is supported by 16 to 20 C-shaped rings of hyaline cartilage. The trachea is named for the corrugated texture imparted by these rings; you should be able to feel a few of these between your larynx and sternum. Like the wire spiral in a vacuum cleaner hose, the cartilage rings reinforce the trachea and keep it from collapsing when you inhale. The open part of the C faces posteriorly, where it is spanned by a smooth muscle, the trachealis (Figure 3). The gap in the C allows room for the esophagus to expand as swallowed food passes by. The trachealis muscles contract or relax to adjust airflow. The lumen of the esophagus is normally closed because, unlike the airway, it has no skeletal support structures to hold it open. When the oral cavity is full of liquid or food, the soft palate is swung down (depressed) to close the oropharyngeal isthmus, thereby allowing manipulation of food and fluid in the oral cavity while breathing. When swallowing, the soft palate and parts of the larynx act as valves to ensure proper movement of food from the oral cavity into the esophagus. The soft palate elevates to open the oropharyngeal isthmus while at the same time sealing off the nasal part of the pharynx from the oral part. This prevents food and fluid from moving upward into the nasopharynx and nasal cavities. The epiglottis of the larynx closes the laryngeal inlet and much of the laryngeal cavity becomes occluded by opposition of the vocal folds and soft tissue folds superior to them. In addition, the larynx is pulled up and forward to facilitate the moving of food and fluid over and around the closed larynx and into the esophagus. The neck contains the seven cervical vertebrae and associated muscles, parts of the alimentary and respiratory tracts and the thyroid gland. In the midline immediately anterior to the vertebrae is the pharynx, which continues as the cervical oesophagus (Figure 2). Anterior to these are the larynx and upper trachea with the thyroid gland. On each side of the organs, major vessels pass between the thorax and the head, accompanied by nerves and lymphatics. The butterfly-shaped thyroid gland is located just inferior to the larynx (voice box). It is composed of right and left lateral lobes, one on either side of the trachea, that are connected by an isthmus anterior to the trachea (Figure 3 and 4). Note: (a) Anterior view. (b) Longitudinal section of the trachea showing the action of the mucociliary escalator. (c) Cross section of the trachea showing the C-shaped tracheal cartilage. The larynx (Figure 2 and 4) and the trachea are anterior to the digestive tract (esophagus) in the neck and can be accessed directly when upper parts of the airway system are blocked. A cricothyrotomy makes use of the easiest route of access through the cricothyroid ligament (cricothyroid membrane) between the cricoid cartilage below and thyroid cartilage above. The cricothyroid ligament can be palpated in the midline, and usually there are only small blood vessels, connective tissue, and skin (though occasionally, a small lobe of the thyroid gland-pyramidal lobe) overlying it. The functional importance of the nasal cavity becomes especially obvious when it is bypassed. If the upper airway is obstructed, it may be necessary to make a temporary opening through the anterior wall of the trachea inferior to the larynx and insert a tube to allow airflow—a procedure called tracheostomy. This route of entry is complicated because large veins and part of the thyroid gland overlie this region. Although tracheostomy prevents asphyxiation, the inhaled air bypasses the nasal cavity and thus is not humidified. If the opening is left for long, the mucous membranes of the respiratory tract dry out and become encrusted, interfering with the clearance of mucus from the tract and promoting infection. When a patient is on a ventilator and air is introduced directly into the trachea, the air must be filtered and humidified by the apparatus to prevent respiratory tract damage. The larynx is a cartilaginous chamber about 4 cm (1.5 in.) long (Figure 1). 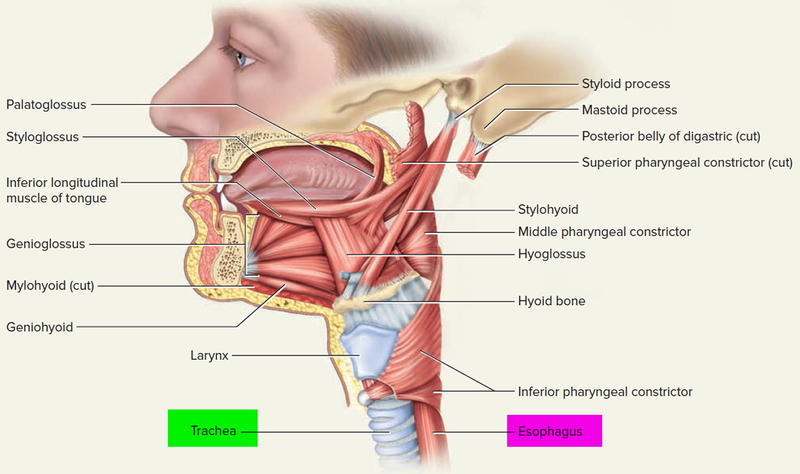 Its primary function is to keep food and drink out of the airway, but it evolved the additional role of sound production (phonation) in many animals; hence, we colloquially think of it as the “voice box.” The superior opening of the larynx is guarded by a flap of tissue called the epiglottis. At rest, the epiglottis stands almost vertically. During swallowing, however, extrinsic muscles of the larynx pull the larynx upward toward the epiglottis, the tongue pushes the epiglottis downward to meet it, and the epiglottis closes the airway and directs food and drink into the esophagus behind it. The inner lining of the trachea is a pseudostratified columnar epithelium composed mainly of mucus-secreting goblet cells, ciliated cells, and short basal stem cells (Figure 3). The mucus traps inhaled particles, and the upward beating of the cilia drives the debris-laden mucus toward the pharynx, where it is swallowed. This mechanism of debris removal is called the mucociliary escalator. The connective tissue beneath the tracheal epithelium contains lymphatic nodules, mucous and serous glands, and the tracheal cartilages. The outermost layer of the trachea, called the adventitia, is fibrous connective tissue that blends into the adventitia of other organs of the mediastinum, especially the esophagus. At the level of the sternal angle, the trachea forks into the right and left main bronchi. The lowermost tracheal cartilage has an internal median ridge called the carina that directs the airflow to the right and left bronchus. What is the pharynx ?